At times our everyday lives can seem troubling or tiring; when listening to the news is a never ending litany of despair, accomplishing our To-Do list is an impossibility and taking action on our intentions seems thwarted by the uncertainty we feel toward change. It’s at times like these that we are desperate for some reassurance that all is well. Lately I’ve been noticing the many things in my day-to-day life that slow me down and force patience, such as cooking, cleaning, walking and being in the company of others, as instruments of grace. Things that used to seem mundane have taken on a whole new proportion. 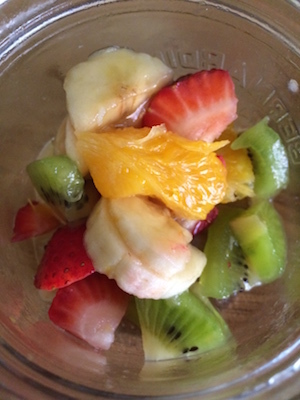 I enjoy cutting up a kaleidoscope of fruit every morning for breakfast and the process of making a salad for dinner. Preparing meals is an instrument of grace. I enjoy washing dishes in a sudsy sink and sweeping the kitchen floor as I watch it change from messy to clean. Housework is an instrument of grace. I enjoy walking my dog in the woods. Being in nature is an instrument of grace. I enjoy lingering in conversation over dinner with my family, watching a play with an attentive audience and attending choir practice a few times a week with someone telling me exactly which notes to sing next. Being in the presence of others in simple activities is an instrument of grace. Take a moment right now to acknowledge the things in your life that steady you. When your life feels complicated, turn to these every day activities that slow you down and force patience. Let yourself rely on these mundane activities as instruments of grace. This entry was posted in new awareness, Uncategorized. Bookmark the permalink. Both comments and trackbacks are currently closed.